From its inception, the United States made use of spies. The nation's first spymaster, General George Washington, recognized the need for accurate intelligence during the Revolutionary War. In a letter written July 26, 1777, Washington wrote: "The necessity of procuring good intelligence is apparent & need not be further urged—All that remains for me to add is, that you keep the whole matter as secret as possible." From his experience as a British officer in the French and Indian war, he often relied on intelligence provided by Native Americans to keep his troops mobile and out of reach of the enemy. Intelligence operations in the American colonies, though, predate the war. In 1765, after the British passed the hated Stamp Act, a confederation of dissident groups called the Sons of Liberty formed to harass the British. By 1772 the Sons of Liberty had evolved into the Committees of Correspondence, whose purpose was to share information in resisting colonial rule. In Boston, members of the committee, including Samuel Adams and John Hancock, patrolled the streets at night, observing the movement of British troops and warning rebels in the countryside of impending British raids that might turn up caches of arms and gunpowder. The Boston group learned that on one of these raids the British intended to arrest Adams and Hancock, but it was unclear whether troops leaving Boston would travel across land or up the seacoast. In an early instance of intelligence tradecraft, Paul Revere arranged a signal that would give the rebels in the countryside advance warning of the direction of the raid—lanterns hung in the steeple of Boston's Old North Church. His stratagem, "one if by land, two if by sea," was immortalized by Henry Wadsworth Longfellow in his poem Paul Revere's Ride. This raid went down in the history books as the Battles of Lexington and Concord, the opening salvos in the Revolution. The Revolution also produced the new nation's first intelligence "mole" and the nation's first cryptanalyst. The mole was Dr. Benjamin Church, who posed as a member of the Boston group while secretly providing intelligence about American rebel activities to General Thomas Gage, commander of the occupying British troops in Boston. Later, as chief surgeon of the Continental Army, Church continued to funnel information to the British. He was finally exposed through a compromising letter he wrote in code. The letter eventually fell into the hands of Washington, who hired an amateur cryptanalyst, the Reverend Samuel West, to decipher it. Church was sent into exile and never heard from again. Even Benjamin Franklin took part in spy games as head of the nation's first formal intelligence-gathering organization, the Committee of Secret Correspondence. Formed in 1775, the committee's principal goal was to gather information about sentiments toward the Revolutionary War in Europe. Franklin secretly negotiated with European powers to purchase arms and supplies. He also negotiated with France to procure the aid of French troops, whose arrival broke the war's stalemate and ultimately turned the tide in favor of the colonists. In the decades following the Revolution, Americans adopted an isolationist stance and were absorbed with the task of building a nation, so they saw little need to take part in international espionage or to defend against it. As a result, the nation had few secrets, and the French, British, and Spanish in particular had little trouble learning American intentions. As tensions mounted again between Great Britain and the United States before the War of 1812, the British had secret agents throughout the country and even in the government itself. For its part, U.S. intelligence was so feeble that troops did not even have accurate maps of U.S.-Canadian border areas, the staging ground for British attacks. Even when U.S. authorities did acquire intelligence information, no one knew what to do with it. They knew, for example, that the British intended to burn Washington, D.C. No steps were taken to protect the capital. movements and the fortifications around cities like Richmond, Virginia. As an amateur, though, Lloyd developed no way to pass information in secret, and he even carried much of the information he gathered about with him on his person. In the North, two rival intelligence organizations formed. 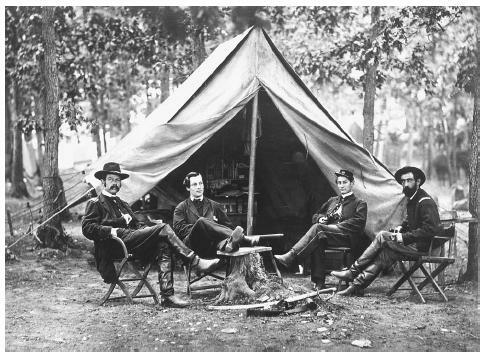 One was run by the famous detective Allan Pinkerton, who reported to General George McClellan, commander of the Army of the Potomac. The other was headed by Lafayette Baker, who reported to General Winfield Scott and later to the secretary of state. These rival organizations often worked at cross-purposes, on occasion even arresting one another's members. While they frequently unearthed valuable information about Southern troop movements, officers assigned to intelligence work lacked experience and there was little coordination of their efforts. Too frequently, Northern commanders failed to act on the information they received. The South, meanwhile, carried on widespread intelligence operations against the North, although again it is difficult to separate fact from fiction because when Richmond, the Confederate capital, fell, virtually all records of their operations were destroyed. Thus it remains an open question, for example, whether John Wilkes Booth, Lincoln's assassin, was on the Confederate payroll as a spy. As an actor, he traveled freely throughout the cities of the North, giving him ample opportunity to meet with members of the network of spies the South had placed in New York City, Baltimore, Washington, Philadelphia, and other cities. In 1864 he played several engagements in Niagara Falls, New York, a hotbed of Southern espionage just over the border from Montreal. Montreal was the headquarters of the "Canadian Cabinet," a group of Southern leaders who directed espionage operations against the North. After fires broke out in several New York City hotels on November 25, 1864, a captured Southern agent confessed that the fires were the work of the Canadian Cabinet. Booth, it turned out, had been in Canada in the days preceding the arson raid and had met with the cabinet. Further, one of Booth's co-conspirators in the Lincoln assassination was John Surratt, a known Confederate spy and gun runner whose mother, Mary Surratt, was later hanged for her role in Lincoln's death. The beginnings of professional intelligence. In the decades between the Civil War and World War I, the United States took its first faltering steps toward development of an organized, professional intelligence capability. In 1885, President Grover Cleveland called for assignment of military attachés to foreign countries to gather information. During the Spanish-American War of 1898, the United States acquired—and most importantly, acted upon—human intelligence about Spain's war-making capabilities. John Wilkie, head of the U.S. Secret Service, broke up the "Montreal spy ring" Spain had put in place in Canada. Before and during American participation in World War I, counterintelligence agents of the FBI and Secret Service were successful at ferreting out German agents and saboteurs within the United States, but during the war, the nation relied on cooperative arrangements with the British for overseas intelligence. It was the British, for example, who broke German diplomatic codes and in 1917 intercepted and deciphered the infamous Zimmermann telegram revealing Germany's intention to begin unrestricted submarine warfare against the United States. Between the two world wars, American intelligence again fell into abeyance. Typically, only inexperienced officers with little or no training in intelligence were sent to staff foreign embassies, so little valuable intelligence about Soviet, German, and Japanese intentions was acquired on the ground. Most U.S. intelligence was directed internally against radicals, subversives, communists, and anarchists during the "Red Scare" of the 1920s and against Nazi agents in the 1930s. The United States did, however, make strides in code breaking and began to develop an organized intelligence capability. In 1922, William Friedman, a Russian immigrant, was appointed chief cryptanalyst of the Army Signal Intelligence Service (SIS), which broke the Japanese Purple code, the principal cipher Japan used to send diplomatic messages as tension between the United States and Japan mounted. After the Japanese attack on Pearl Harbor on December 7, 1941, U.S. intelligence efforts focused on cracking Japan's code for transmitting military messages. Leading the effort, code-named "Magic," was the U.S. Navy's Combat Intelligence Unit. Using complex mathematical analysis, IBM punch-card tabulating machines (the first example of cooperation between the military and private enterprise to gather intelligence), and a cipher machine, the unit was able to crack the code. Throughout World War II, the United States intercepted and decoded thousands of Japanese communications; cryptanalysts gave U.S. war planners advance notice of Japanese plans to attack Midway Island in June 1942, allowing U.S. forces to lie in wait, defeat the Japanese, and turn the tide in the Pacific. Modern U.S. intelligence. The chief deficiency of U.S. intelligence during World War II was that it was scattered among the various branches of the military; whatever coordination it received happened only on President Franklin Roosevelt's desk. To correct this deficiency, Roosevelt appointed William J. Donovan, a New York lawyer and former Army colonel, to assemble a plan for an intelligence service. Out of Donovan's plan emerged the Office of Strategic Services (OSS) in June 1942. Under Donovan's leadership, the OSS was given the task of collecting and analyzing information needed by the Joint Chiefs of Staff and to conduct "special operations," or clandestine operations that were not carried out by other federal agencies or the military. Throughout the war the OSS provided policy makers and the military with enemy troop strength estimates and other intelligence that was crucial to planning military campaigns. The cold war with the Soviet Union following World War II gave increased urgency to the need for good intelligence, but opinion was divided about who should conduct intelligence operations and who should supervise their efforts. Roosevelt's successor, Harry S. Truman, divided responsibilities between military and civilian agencies in October 1945 when he abolished the OSS and transferred its operations to the Departments of War and State. Donovan, though, favored the formation of a strictly civilian organization that would coordinate intelligence gathering. Fearing that the plan would lessen their influence, both the military and the FBI opposed it. Truman struck a middle course in January 1946 when he established the Central Intelligence Group (CIG), giving it the authority to coordinate intelligence gathered by existing departments and agencies. The CIG was placed under the supervision of a National Intelligence Authority, which consisted of the president and the secretaries of the State, War, and Navy departments. Thus, for the first time in its history the United States had a peacetime intelligence organization. Less than two years later, though, Congress passed the 1947 National Security Act, creating the civilian National Security Council (NSC) and placing under its authority the Central Intelligence Agency (CIA). Intelligence gathering was now firmly under the control of civilian rather than military authorities. In the 1950s and early 1960s the CIA was the nation's bulwark against the expansion of communism and Soviet influence. It was the CIA, for example, that revealed the presence of Soviet missiles in Cuba during the 1962 Cuban Missile Crisis. Its reputation was tarnished, though, by the disastrous Bay of Pigs operation against Cuban dictator Fidel Castro and reports of unsavory CIA activity during the war in Vietnam and, in the 1970s and 1980s, against unfriendly leftist regimes in Central and South America. After the terrorist attacks of September 11, 2001, the CIA took on added luster as the nation looked to it as the front line in the fight against terrorism. In its early years the CIA relied primarily on human intelligence and field operations. Its science and technology efforts were scattered among various CIA divisions, or "directorates." With the success of overhead intelligence-gathering technology, including the U2 spy plane and reconnaissance satellites, then CIA director John McCone wanted to gather all of the agency's scientific and technological capabilities under one roof. The result was the formation of the Directorate of Science and Technology (DS&T) in 1963. Throughout its history, the DS&T has enjoyed numerous successes, developing high-tech imagery and eavesdropping satellites and a host of other sophisticated tools that have proven invaluable in acquiring information while keeping American operatives out of harm's way. Andrew, Christopher. For the President's Eyes Only: Secret Intelligence and the Presidency from Washington to Bush. New York: Harper Perennial, 1995. Kahn, David. The Code-Breakers: The Comprehensive History of Secret Communication from Ancient Times to the Internet. New York: Scribner, 1997. Miller, Nathan. Spying for America: The Hidden History of U.S. Intelligence. New York: Paragon House, 1989. O'Toole, G. J. A. Honorable Treachery: A History of U.S. Intelligence, Espionage, and Covert Action from the American Revolution to the CIA. New York: Atlantic Monthly Press, 1991. Richelson, Jeffrey T. A Century of Spies: Intelligence in the Twentieth Century. New York: Oxford University Press, 1995.